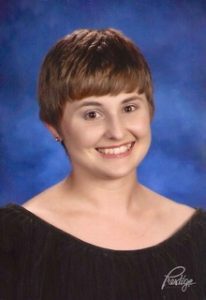 The Charlotte Chorale is pleased to announce that the winner of the $3,000 R. Bruce MacGregor Memorial Scholarship is Allison Deal, a senior at Lemon Bay High School. Congratulations, Allison! The Charlotte Chorale wishes you all the best for your future. Allison comes from a long line of musicians in her family — both parents, grandmother, great grandparents, and two great uncles who toured with professional bands in the 1920s. Allison began playing trumpet seven years ago, choosing the trumpet which she said “made the best sounds and is so versatile.” She enjoys playing classical, pop, swing, funk, rock, and Latin, although classical is her favorite, as she says it “has the greatest emotional impact on me”. Allison was the featured trumpet soloist in an outstanding rendition of “One Faith, One Hope, One Lord” at The Charlotte Chorale’s 2018 Christmas concert, in addition to being a part of the INSTRUMENTAL ENSEMBLE for the Christmas and several previous concerts. She will also be playing at the upcoming Chorale concert, “Puttin’ on the Glitz”, on April 13 at the Charlotte Performing Arts Center in Punta Gorda. She is currently choosing between two colleges, Stetson University and USF, with a goal of pursuing a career that can combine music performance and digital media in ways that are, for her, creatively fulfilling. When asked about her favorite trumpet artists, Allison named Tine Thing Helseth, who Allison said really “sings” when she plays, and Wynton Marsalis, a master of both classical and jazz.